People can say chatting application is very competitive market and now Google Allo APK 0.1.177_RC04 tries to establish its place on this area. As one of products from giant tech company, this app is not merely chatting or messenger platform. You can see some differences between this app and competitors, though it is difficult at first glance. Google brings what the most people want while chatting with friends and family. It is what makes this app very recommended for you to install it at smartphone. The next section will explain features and benefits of Google Allo. Google introduces the smart reply feature as one of interesting part from this app. When you text friend, it will create pattern that make app learn your way of chatting. You usually say yes to agree about something then Allo generates this word for you. If you tend to say “hi” instead of “halo”, this app will do the same thing. It is very helpful because you do not need to write the same word respectively. With your approval, app answer for chatting will be sent. Moreover, chatting or sending message requires phone number. You can contact anyone directly to join in private conversation. Sometimes, conversation goes on silence way, so Allo will suggest some topic to keep chatting flow. Since this app is from Google, you will get full access to other apps and use the synchronization mode. Allo offers wider topics to help user conversation to be more meaningful. You can put link on YouTube or open email while Allo is in active mode. The pattern of user is the strongest point for this app to compete with existing competitors. With smart suggestion, Allo provides more just one word to reply, but the complete sentence that refers to your behavior of Google platform. If you want privacy, incognito mode is available as similar to Chrome browser. 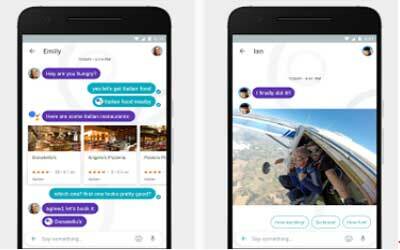 Therefore, Google Allo for android is new way to communicate in your life.